One of our fundamental goals in creating League of Legends champions is ensuring each has a distinct, cohesive, and well-executed identity. In a game with an ever-expanding roster of champs, some are better examples of this than others -- especially when you consider some of the older characters inhabiting the Rift. Some champions don’t offer distinct enough gameplay, despite working well within their role. Some champions have fundamental things that feel right, but require a more cohesive package. Others need to be rebuilt from scratch (see: Poppy). Champion Update is the team tasked with sorting out which champions fit where, and figuring out how to update and upgrade as needed to help those champs reach their full potential. This process isn’t without risks. If Champion Update is committed to the goal of blowing players away and defying their expectations, the occasional strike will always be a possible side effect of swinging for the fences. When the ChampUp team looked at Fiora earlier this year, it spotted some major gameplay problems. With no dodgeable spells and immense damage output, a fed Fiora felt like an unfair opponent. If she caught someone, she killed them -- end of story. Her tower dives were legendary. But Fiora’s strength hinged heavily on her early-game performance; if she was behind, there wasn’t any real way to come back. Even worse, she lacked utility that could make up for her low damage output, leaving a struggling Fiora no option but to sacrifice herself to the fray in the hopes of at least contributing a bit of useful damage. Fiora was either an unstoppable monster or a liability to her team. Additionally, ChampUp saw a mismatch in the promise of her character and her actual gameplay, as game designer Stash Chelluck explains. “She was promised to be the Grand Duelist,” says Chelluck, “but her pattern felt very straightforward. It required little thought and reactivity.” And so, ChampUp dove into Fiora’s kit and started making tweaks. Instead of focusing on what could be dialed back or toned down, ChampUp looked for opportunities to more effectively tie her gameplay to her in-game persona. Says Seb Rhee, who lead the ChampUp team during the Fiora re-work, “that’s where Stash discovered the really interesting fencing gameplay -- the idea of dueling between two players. Not only would it solve some of her innate gameplay problems, it would make her more cohesive as a character.” The new duel mechanics would help Fiora live up to the image of a talented duelist who can dodge attacks and hit opponents where they’re weakest, along with providing some much-needed utility in the event that she fell behind. Going big with Fiora’s mechanics posed significant risk. Players who loved her old ult, for example, likely wouldn’t be happy to see it removed. However, ChampUp often has to remove pieces of the original champion in the interest of making him or her better overall (Sion’s original VO, for example). The decisions aren’t easy, but the hope is always that players feel like they’re gaining more than they lose. In the case of Fiora, the team felt as though her new mechanics were a marked upgrade from her old kit, enough that the pain of losing some familiar play patterns would be mitigated. With the mechanics in place, the team moved into refreshing Fiora’s visuals. 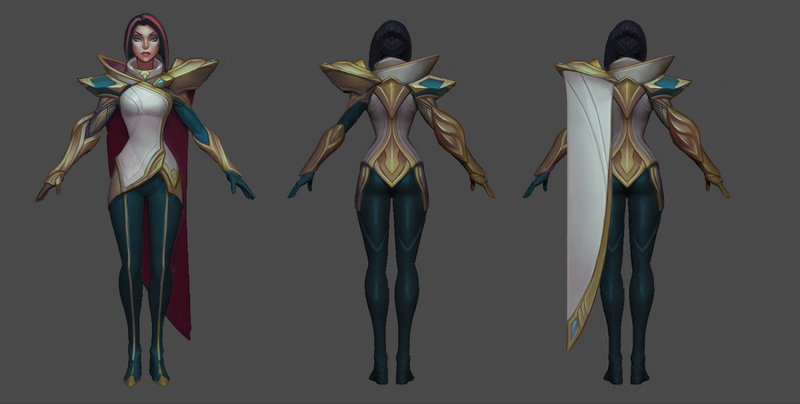 The art team worked to align Fiora’s costume with that of Demacian nobles, using muted golds, clean white fabrics, and high-quality leathers. The team also used visual cues to emphasize Fiora’s character attributes. Says Maurino, “Fiora is a sharp character; her design is going to have a lot of aggressive points. Her armor comes to a point. Her tunic ends in a point. Anything we can do to drive home what the character represents on first read is a high priority.” From a design perspective, it’s important that players can glance at a character and tell exactly what that character is about. The art adjustments weren’t limited to costuming. ChampUp also took a knife to Fiora’s features, both on the in-game model and in the new splash art set to accompany her launch. Maurino walks through the thought process of artists working on the update: “We stylized Fiora very intentionally. We decided to give her a much more chiseled face. We wanted to make her sharp—not just in design and costume, but in features. He hair was sharp and her face was much more rigid.” Each change was carefully considered in terms of what it conveyed about Fiora as a character and as an in-game weapon. It was another big risk -- one that wouldn’t play out quite as well as the one the team had taken with her mechanics. 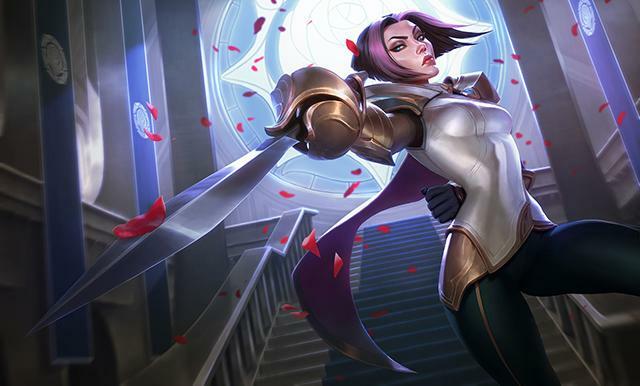 Initial reactions to Fiora’s updated art were negative, to say the least. 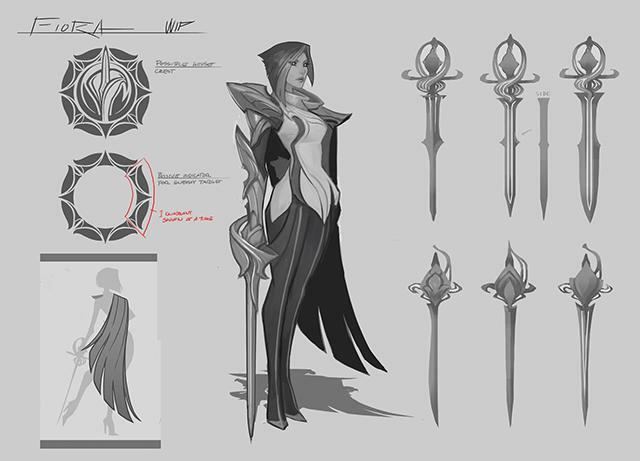 Across the League of Legends community, Fiora fans expressed concerns about her new, more angular design. While players were largely in support of her gameplay changes, they rejected her art changes almost unanimously. The outcry was a stark contrast from what the ChampUp team had expected. It seemed as though the team and players had dramatically different visions for Fiora’s identity and how that identity should be represented. The feedback highlighted a disconnect between ChampUp’s understanding of Fiora and the understanding players had developed through their interactions with her. In playing as Fiora, game after game, players gave her an identity of their own invention. Rhee frames it as a natural evolution: “Once a character goes live and players learn that character and use that character (sometimes in ways we don’t anticipate), that character becomes something different from what we built.” In other words, the character matures. Rhee explains that players rejected Fiora’s new art not because of its objective quality, but because “the update failed to honor who Fiora had become for players.” ChampUp focused on her haughtiness and better-than-thou attitude, but players more closely associated her with a young, beautiful swordswoman. This type of feedback, though difficult to hear, is immensely resonant to teams like ChampUp. Players weren’t reacting from a negative space or from an aversion to change, but to something that betrayed their understanding of a character they cared about. Notes Rhee, “It’s not so much that players are loyal to a particular hairstyle, or to Fiora’s cheekbones. They’re loyal to what Fiora represents to them, to the parts of the character that resonate.” Again, players had been asked to give something up -- in this case what they gained didn’t feel like more than they lost. ChampUp worked hard to accommodate player feedback by making changes to Fiora’s new art, softening her features and bringing her hair closer to the original design. But without the bandwidth for another complete overhaul, the team had to settle for a middle-ground. “In the end,” concedes Rhee, “our corrections were more of a compromise. We made a lot of players happier with the changes we made, but ultimately it felt like us and players may have started with different understandings of Fiora.” It’s a lesson the team won’t soon forget. For ChampUp, success isn’t measured by the quality standards set by artists or designers. Says Rhee, “Fiora’s update shouldn’t be judged by ‘What did we want to make, and did we make it?’ It’s measured by, ‘How do players feel about this? Do players love this change? We try to surprise and to do things players don’t expect, but that end goal is always present.” The objective quality of art assets or VFX are a lower priority than whether those elements reflect player passion for a given champion. A miss is a miss, regardless of its technical execution. The Fiora update and the controversy surrounding its art brought plenty of self-examination for the ChampUp team. Champion Update isn’t here to change things for the sake of change, but to improve League of Legends by constantly improving upon the game’s roster of champs. If changes -- artistic, mechanical, or otherwise -- don’t feel like big gains to players, those changes are missing the mark. The Fiora update served as a lesson on both ends of what can happen when we work to improve the characters players know and love, and a reminder that these improvements aren’t without their potential pitfalls.